After calling numerous framers who were unable to work with her, Desley came to ARTIS PURA with her special framing needs. 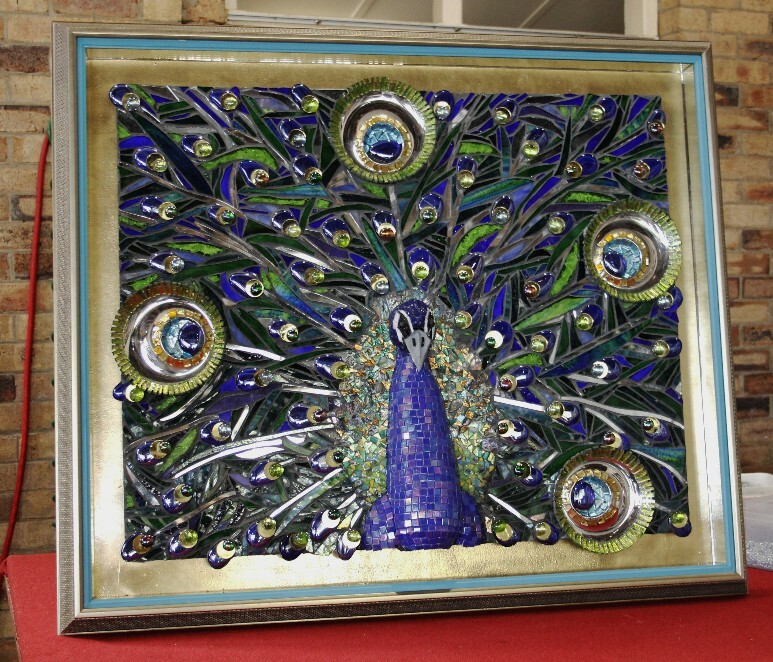 Having been fighting ovarian cancer for years, she wanted to create beautiful pieces, framed in a unique way as a lasting memory for her grandchildren. 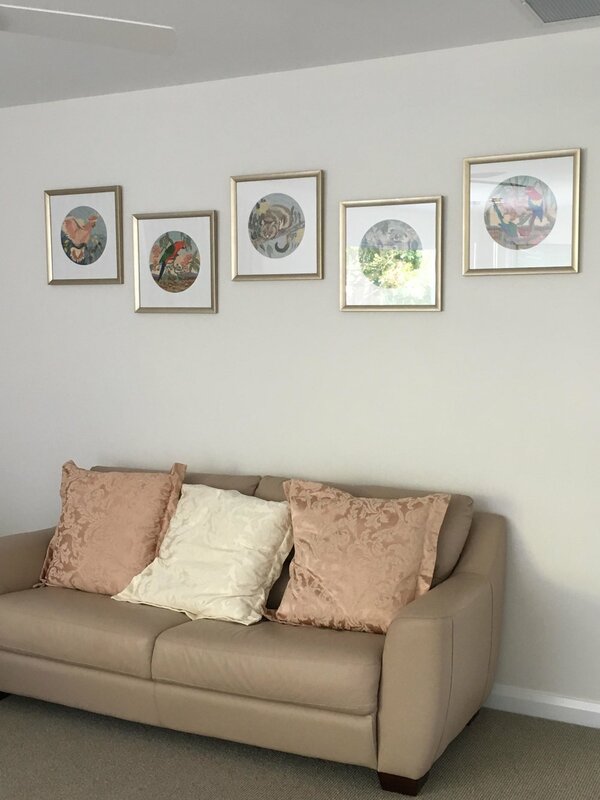 ARTIS PURA brainstormed with her and devoted ourselves to making each framed piece of needlework truly reflective of Desley's love for her grandkids. Desley had the idea of a porthole but was unable to get help from her previous framer. ARTIS PURA repurposed an existing circular frame for the HMAS Jaxon. This frame turned out to be exactly the right size. It's like we were in tune with the universe, which wanted this project to go forward. ARTIS PURA removed four ornaments from the original frame and hand cast the bolts and hand-finished the frame to give it that old world style. The final details are hand engraved (not laser engraved) plaques, hand patinaed, and oxidized to look aged, adding the personal touch reading "HMAS Jaxon" and "Christened by Grandma 2015." Evie May, received a white timber grain shadow box frame and hand-finished matts with colours chosen to match the colours in the stitching. The shadow box is lined with orange which matches the lines in the inset matt, giving the work some extra pop. On this piece, ARTIS PURA used Tru Vue museum quality glass so it looks like there's no glass at all. Tru Vue makes the colours pop, is crystal clear and has UV protection to keep the piece from fading. This is a major improvement over traditional non-reflective glass commonly used in the 1970s and 80s which used an etched finish creating a diffuse and fuzzy view. Since Evie May is Desley's grandchild's dog, we wanted it to be personalised. The dog collar tag is an actual dog tag, hand-engraved (not laser-engraved) with Evie May's name. Each year, Desley takes one of her grandchildren on a vacation to anywhere they want. The koi represent one of those trips. The frame is an ARTIS PURA design, influenced by a previously purchased frame. With a hand finished matt to match the colours of the needlework. Instead of the usual picture hanger, we capped this piece with a traditional oriental hanger. The last of Desley's four pieces is this Rubik's Cube. 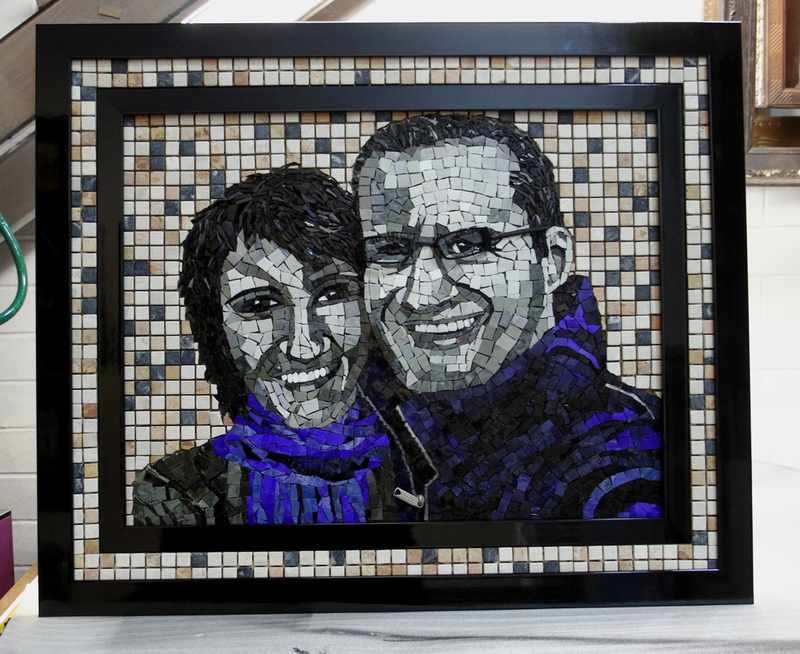 Originally Desley's idea was to have each side of the frame in a different colour. Ordering four different sticks of moulding and cutting them to size would have been expensive. 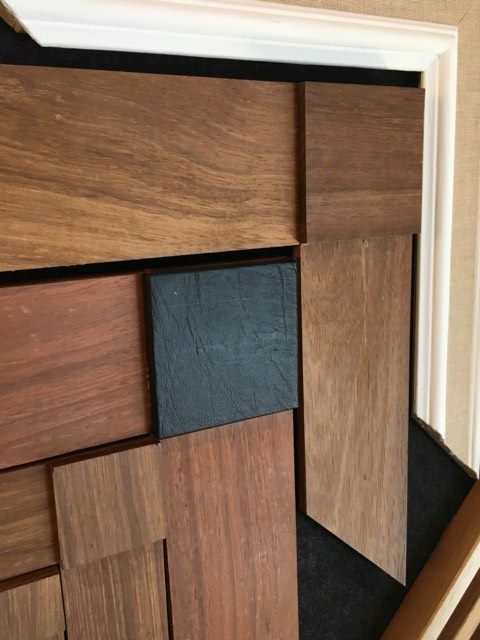 As Erin was looking at corner samples against the work, she realised that a Rubik's Cube is all about the corners and that using her samples would allow us to both cut costs and give the frame a more cube look. After which, they were replaced with new samples from her wholesaler. Fighting cancer is an expensive journey, ARTIS PURA took steps to lower the cost for Desley where we could. ARTIS PURA wants to make sure each customer's dreams are met when we create frames for them. In the end, that's what makes us happy, making sure our customers are happy. 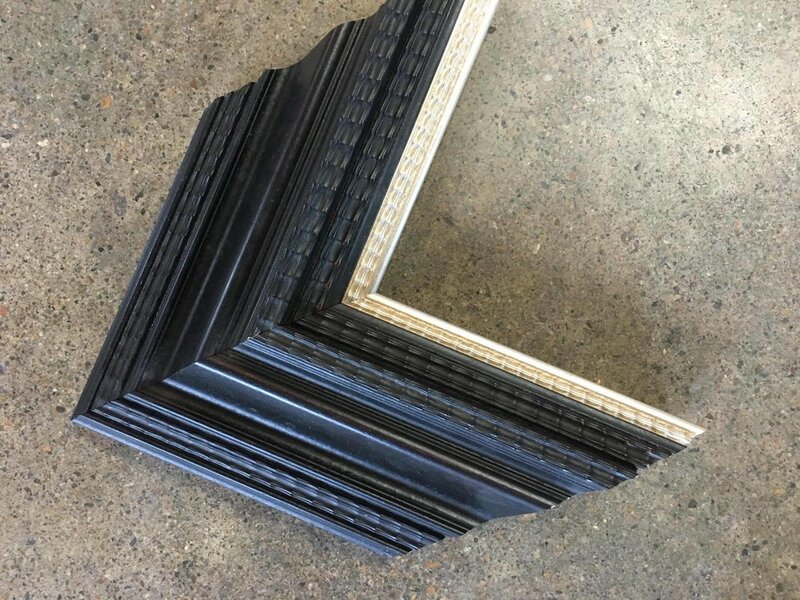 If you have a unique project which needs special custom framing, come on by and let us help you.